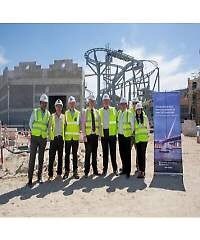 DUBAI, United Arab Emirates – It’s only been two years in the making, but Motiongate Dubai’s development is on schedule; it will open its doors as the biggest theme park in the region this October. And it’s a small company that’s responsible for much of the progress. The Deluxe Group, a Northern Irish company working alongside Dubai Parks and Resorts, landed the project as it was part of a global entertainment initiative that fell within their niche: movie franchises. But Deluxe Group had not always focused on amusement parks. Operating since 1969, the privately owned, family-run firm had generally stuck to the commercial, retail and luxury residential market sectors. Then 25 years ago they decided to specialise in theme parks. A year later, they landed their big break: developing Disneyland in Paris. “The plan to build a park themed to DreamWorks, Sony Pictures, Lionsgate, Smurfs Village and Studio Central animation characters emerged to take the form of Dubai’s newest leisure and entertainment destination in 2014. Motiongate Dubai will be part of a larger complex of theme parks, which will include Bollywood Parks Dubai and Legoland Dubai. The entire complex will estimated to cost Dh10.5 billion that will cover 25 million square feet on the south side of Dubai near the border with Abu Dhabi. The complex is expected to attract 6.7 million visitors in its first year of operations. Motiongate Dubai will boast 27 attractions, with dining, retail and entertainment options throughout the area,” Hill said. In addition, the park will boast 27 attractions, with dining, retail and entertainment options throughout the area. Dubai Parks and Resorts estimate Dh2.4 billion in revenue will be made after a year of operation and more than 5,000 jobs will be generated across the sector thanks to the expansion. Posted on April 24, 2016, in Other. Bookmark the permalink. Leave a comment.